They all start out small. Spring is my most favorite season of the year. To take a walking tour around the property to see if all the plants made it through the winter is an adventure for me. I truly enjoy it with all my heart. I'll often sneak out in my houseshoes and morning cup of coffee to see if there's anything new that popped up overnight. Remember this? Well it's true. This gorgeous and wild and untamed pink azalea began in a little one gallon bucket as a Mother's Day gift from Zach probably 15 years ago. At the time, I planted it just outside our basement door. As our landscaping plans changed, I moved it. Several years ago, it was moved again to this spot. It has survived cold winters, a multitude of puppies interested in chewing on everything, and me - the mover of the bush. It's really a perfect spot for this pink beauty because as its buds appear and the blooms begin to open, the leaves on the trees around it are beginning to green as well creating a perfect backdrop. The hosta's to the left of the azalea all began from a clump of hosta plants that Gordon's Mamaw Wright planted many years ago. I keep thinning them out and dividing them and filling in spots around the yard...all from the original plant. They start out small and grow into big, lush plants in just a few years. The sickly hydrangea bush to the right is also from an original plant from Gordon's Mamaw. I refuse to give up on it and will probably just have to prune it almost to the ground to bring it back to life. We had a hard winter and I so want to know that this one will make it. Hydrangea's are one of my all time favorite flowers and I want to be able to give cuttings off of it to the kids when they have their own homes. 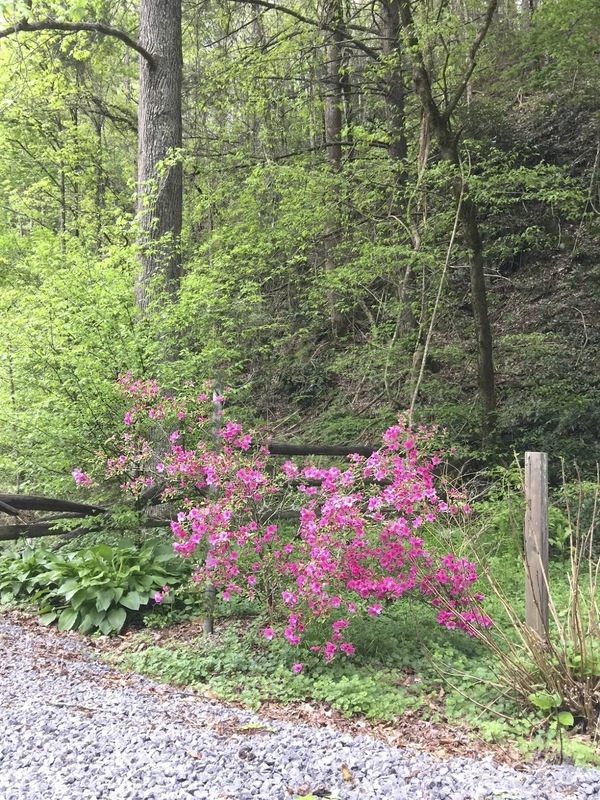 When I see this azalea every day as I head out the driveway dropping Isabella at the barn to feed the kitty and then driving my two babies to school, I think about my oldest baby no longer living at home far away in Charleston and how he was so proud to give this gift of love. Who knew that this small gift would continue to bring me smiles and joy 15 years later. So, just as this azalea started out small, so did my Zach. He's grown, too. He's now 23 and 6' 1". And they're both happy where they are. For now.